I admit, I hadn’t even heard of Robert Rauschenberg, let alone seen any of his work before visiting Tate Modern’s current exhibition (open until the 2nd of April). In fact, I wasn’t even planning to go to this one – I was just too lazy to walk across half the building to get to the exhibition I’d really come for. So, the guy with the funny name it was. The first thing that struck me was a large work to the right of the entrance, which several people crowded around, heads tilted in that peculiar way you see only in galleries. Automobile Tire Print consists of pieces of white paper, fastened together at their narrowest point, with the track of a car tyre running down their length. With pieces like this, Rauschenberg’s intention was to create art that questioned and disrupted the link between artist and work, for example, by having his friend drive the car. This theme was common throughout many of the other collections; an inquisitive nature that derailed artistic convention. 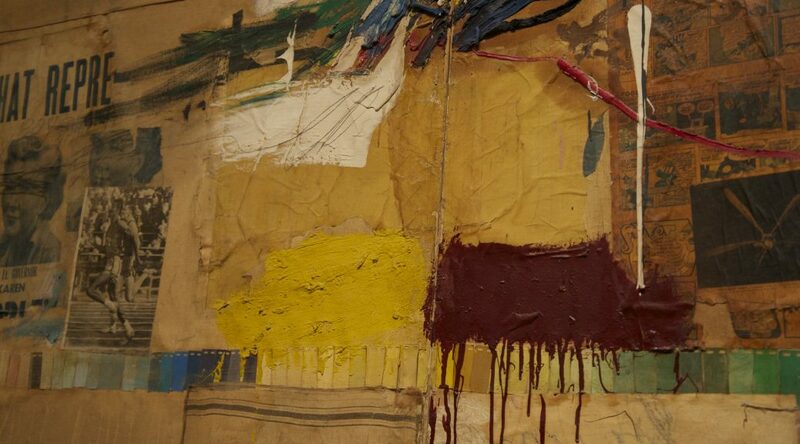 Rauschenberg was revolutionary. His work interrogated traditional art to the point where to look at it, you sometimes question whether it is still art at all. But of course it is, and before anyone chips in, no, a five year old would not have been capable of producing any of it. Another common narrative in his work was the tendency to combine different forms of art, crossing the boundaries of regular conceptions of the various forms. For instance his Combines deployed paint as well as sculpture, to create hybrid sculptural-paintings. They draw you into their midst, encouraging you to consider the placement of the ordinary objects he used, and the muted or vibrant colours. This was art that involved the audience because it touched them, made them wince slightly, perhaps even made them uncomfortable. One of my favourite aspects of the exhibition was a history of Rauschenberg’s work for his friend’s dance company. He created many sets and costumes for the dancers who would engage in contemporary and collective dance; from an artistic interpretation of everyday movements to engagement with the sets themselves. These dancers would have had to consider not only the art that they were performing (the dance) but also that which they were interacting with. I’ll end this article on a rather brilliant decision of his, a perfect representation of Rauschenberg’s character. Upon realising that he had been accepted into a well-regarded art exhibition which had rejected work by both his wife and his friend, he decided to include both of their works into his own. This display of outright contempt towards accepted authorities on art is reminiscent of many previous artists and artistic movements that, like Rauschenberg, manipulated traditional standards of art and reacted against the cultural institutions of their day. The Robert Rauschenberg exhibition continues at the Tate Modern until 2nd April 2017. Exhibition fees apply.